If you're American with an average-sized head, your noggin is likely bigger than your ancestor's was seven generations ago. That's the implication of research by Richard Jantz and colleagues at the Forensic Anthropology Center at the University of Tennessee. The scientists analyzed about 1,500 skulls, dated from various years in the 1800s and 1900s. The researchers focused on Caucasian individuals because there weren't as many skulls from blacks and Hispanics. Although their conclusions are about white Americans, there is no reason to believe these patterns don't pertain to other races, Jantz said. More research just needs to be done. 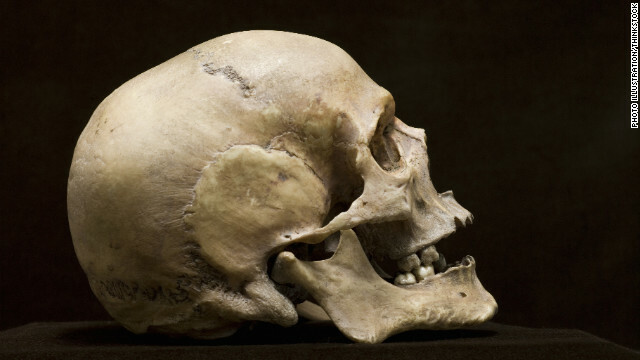 Over the last 150 years or so, it appears that skulls got narrower from side to side by about 5 to 7 millimeters, and higher from top to bottom by an average of nearly 10 millimeters, Jantz said. And the overall size of the head has, on average, increased by an amount equivalent to the size of a tennis ball, he said. For one, there is far more nutrition than ever before in the United States. The problem of obesity - of over-nutrition - is more of a concern than undernourishment. People's work has become less physically-intensive, and even manual labor is often assisted by machines in some way. Because of cars, people walk less. Because of vaccines, epidemic diseases that once killed many children no longer do. Mothers who might not have survived childbirth two centuries ago are now living, thanks to medicines and procedures such as Caesarean sections - their children are surviving, too. And people don't often choose mates with the very same ethnicity – particularly not from the same part of Europe as their own ancestors – as they would have before. "That has resulted in opening up the gene pool," Jantz said. Brain size is probably correlated with skull size, so this means Americans' brains may also be getting bigger, but this has yet to be proven. The next step for researchers would be to see if certain parts of the brain have expanded, which might give an indication of whether there are particular abilities that have been enhanced as a result of this change over time. The researchers did not directly measure the circumference of the head, so it's hard to say whether this trend has had any effect on hat size. Is the increase in skull size part of a larger pattern of the human body growing in general? It's true that people are on average taller today than in the 1800s, but height has plateaued. What about our heads? "I think the skulls will continue to change, and I think the direction depends on the direction the environment goes," Jantz said. "Obviously there have to be limits on how narrow or on how tall it could get, so I don't know if I want to predict how much longer this trend will continue." The researchers hope to get this research published. They presented their findings at the American Association of Physical Anthropologists meeting in April. Awesome. Now let's send some big heads to people in Canada. To Starbelly: Just what is your issue with Canadians? Just curious to know. Please. Canada is a joke. Everyone knows it. It's common sense. Great! Now if Americans can only fill these larger heads with knowledge. One man's garbage is another's treasure. Probably filling it with useless garbage. Did anyone consider that in that same time frame Americans also got taller as well. Wouldn't it be logical for the head to increase in size as well? And apparently they also did not consider issues of sexual selection. Have popular conceptions of beauty caused Americans to prefer taller, thinner faces? Mardi, they addressed the question of overall increased body size in the article. As for sexual selection by preference of appearance... you're taking a VERY narrow view of reproductive habits in the modern world. These days, people with "more desirable" traits (high income, good looks, height, slender build) tend to have fewer children. In population trends, it's not the "desirable" traits that are necessarily selected for – it's merely a matter of whoever has the most children. The question is far more complicated than you seem to realize. No, the sun is getting hotetr. That would heat things up a bit right? There is no evidence that our carbon footprint on the earth is affecting the globe. Al Bore is an idiot. The only reason they want us to buy into the idea of global warming is so that they can start a global, yes global carbon tax. The powers that be are already talking about it. SH$T no skulls of blacks, hispanics? how about American Indians didn't they arrive on this continent like 50 yrs ago? with tv? PLEASE !! this article is just CRAP! Did you hear about the other study – Republican skulls are getting smaller. Could be that people who donate their bodies to science have larger skulls on average. Remains from over a century ago weren't necessarily always donated, so they may reflect a more accurate sample of skull size in the general population, which may not have actually increased. Note that this study appears to have been conducted by the forensic anthropology department using stored remains. I think a larger, more geographically diverse sample of living subjects would be necessary for conclusivity. it's not the size of the head that matters. It is what's inside that head that matters! I imagine the safety of cesearan section birth must certainly be adding to skull size. Baby's head too big for the mother's hips = c-section. Now that baby will pass on a large skull size to his/her kids, who will also probably need to be birthed by c-section. Before modern medicine and sterile surgery, women who were carrying too-large babies would die in childbirth, and the baby too. I blame TV. Typically, people who appear on TV have slightly oversized heads: this makes them more accessible to the audience when they're on camera (look at Vanna White, for example: her head is huge in proportion to her body). Since people key on what they see the most, there's a selective evolution process taking place based on how cameras work. Go figure. Well, Those mothers with larger pelvic outlets WOULD be able to deliver larger headed babies. So, while cesarean deliveries would help one problem, they would not help the small pelvis problem. Still, natural selection would still be able to accommodate this change naturally. start to drop if the obesity trends continue like they have for the last 3 decades. A big-headed baby, prior to the C-Section, may have died in birth. Also, the mother who carried genes that would cause large head size may have also died in child birth. With medical advancements and C-Sections, these people have survived, and the genes for larger head size is passed on. Presto... larger heads. It has to do with TV. Typically presenters on TV shows tend to have larger-than-normal heads because this makes cameras pick up their faces better (Vanna White is an excellent example of this: her head is proportionally massive). Since what one sees the most dictates what one finds attractive, there's now a selective evolution process in play, based upon the way cameras work - especially upon women - most famous women on TV shows have oversized heads (Katey Sagal is another example of this). Much ado about nothing. It turns out that once Barry Bonds was removed from the study the average returned to historical norms. Maybe this is why I have so much trouble finding hats that fit. To Kam, Ur saying that what l am saying about there being only three races is outdated, that that is not the model science using today, do u mean that science is using today. Sense when did more races come about in this world and where did u get this information from, there has always been 3 races and there will always be 3 races. The other races u r probably talking about r broken down into ethnic groups and for ur information there r not any white people, if u look at the color white, there is no one that color. The color ur looking for ur people is pink and for the more paler ones is ghastly pink and all humans are carbon based, r r u going to deny that too, pink-skinned heads r getting bigger but their brains r getting smaller. There is only ONE "race". That is the HUMAN race. Everything else - ethnicity, skin color, national origin, etc - is just window dressing. well they could have done the study on browns to if they had enough heads that havent been destroyed by bulets!!!!! why is there no mention of Asians ? you mentioned blacks and Hispanics, you could have also mentioned Asians. Scientific studies are done with white people, by white people and for white people, because the rest of the sludge-races don't really matter in this white man's world. Life is for the whites, all others are chaff. ...and the rate of autism has increased in this country too. Autistic people are known to have larger skulls and if you look at a lot of them its very noticeable. Yet that doesn't mean its any sort of "good sign" that American skulls are getting larger. I would consider it a bad sign. "The researchers focused on Caucasian individuals because there weren't as many skulls from blacks and Hispanics". That's a provocative line–I wish the article had explained why this is the case. Also, how could they tell?. I predict that in the future our skin will begin to take on a grayish color, our heads will become bigger and we'll have huge eyes. We'll also develop advanced mental telepathy and we'll be flying around in flying saucers and will making trips back in time. The size of one's brain has little or nothing to do with intelligence. There are little people, midgets, dwarves etc., who are much more intelligent than a lot of you big-headed morons in here who talk through your asses. adamBATTAGLIA Posted on whit, your pictures are unaveielbble. sure, i'm really jealous but also REALLY JEALOUS. congrats on what seems to be a successful trip so far. can't wait to see the show. I enjoyed your post over there! If you want to udnrestand the no follow issue more, check out . @Jeanne and Trinity thanks for tagging me! While there are lots of silly memes that go around, this is a good one. @John good idea. I do have my most popular in the sidebar, which accomplishes this purpose too. Posted on That's actually a GOOD idea, using the loom. Just make the yarn thneir, or use a larger loom. It only failed at being what you wanted it to be; I have a purse made out of this, and it's awesome.Keep trying!Katie’s last blog post..